Miami, FL – Karlville Swiss has recently introduced the second generation of fast change, low waste, pouch making machines. These machines are designed to meet the growing market demands of HP Indigo digital flexible packaging printers as well as traditional flexible packaging converters looking to improve the efficiency of short/medium run business. The standard KS-DSUP-400 machine is suitable to produce three-side seal pouches and stand-up pouches from one web, which is the most efficient solution for customers with HP Indigo 20000 presses. For narrow web digital customers with HP Indigo 6900 models, the KS-DSUP-400-GS is the ideal solution to get started making pouches. 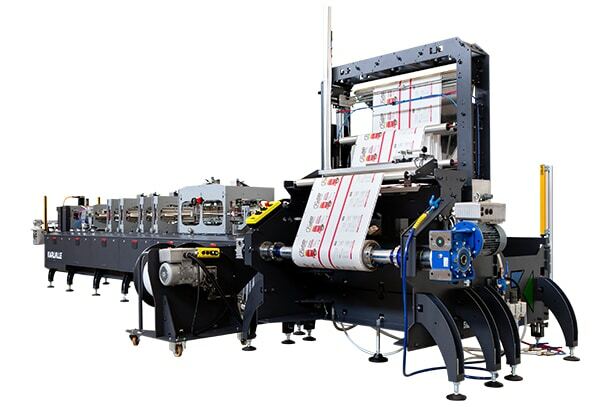 The machine is suitable to produce 3-side-seal pouches from 2 independent webs (printing synchronization included – developed with innovative concepts) and stand-up pouches from 3 independent webs. With this two-registration concept, the customer can increase the size range of pouches dramatically verses standard fold-over ma-chines. Combining both machine models, customers may choose to synchronize webs or fold over a single web to maximize the click utilization rate by printing full webs. This innovation will give HP Indigo users maximum flexibility and efficiency. To satisfy increasing demand for pouch converting machinery, Karlville has expanded engineering, production and support staff in Europe and USA. In addition, machines are now available for customer trials in both Europe and USA. Karlville will host an HP Latin American Open House on March 22nd. This is by invitation only, please contact your HP representative for details. During this Open House, we will show case both lamination technologies, Solventless and Pack Ready Lamination, as well as new Quick-Change Pouch Machine. Providing flexible packaging converting machinery solutions, Karlville supplies lamination, coating, slitting & inspection, shrink sleeves and pouch making machines. In terms of innovation, Karlville supplies the HP Indigo Pack Ready Laminator. This technology is a set of post-print converting solutions for HP Indigo digital presses that provides zero-cure-time lamination, enabling digital converters to print, laminate and pack on demand for immediate time-to-market. With Global Support facilities, Karlville markets and services in all Key HP markets, NA, EMEA, LATAM and APJ.